This is a sneak preview of Rifts® World Book 32: Lemuria. This sneak preview includes the front cover, credits, contents, Lemurian Floating Cities, new Biomancy spell list, Chitin Bio-Armor, and the Panther Shark War Steed. 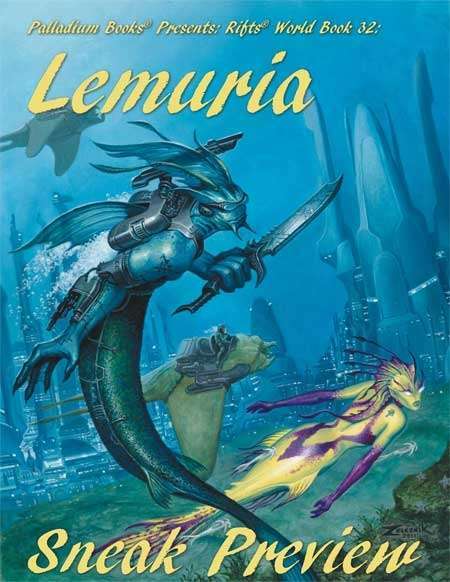 Rifts® Lemuria will be available from Palladium Books in early April, 2012. For more information, visit www.palladiumbooks.com. This title was added to our catalog on March 22, 2012.